We end the week with a weaker dollar, stronger commodities and recovering stocks. I suspect this is a building theme for the year – and that it will be a very lucrative one. With that, let’s take a look at some key charts. To this point, stocks have followed a December loss of 9% with a bouncein January of 6%. We remain about 10% off of the October highs (all-time highs). The opportunity to take advantage of this bounce in stocks is very attractive, but there are even more attractive opportunities in stocks outside of the U.S.
First, and importantly, the dollar is in a long-term bear cycle….and it’s early. 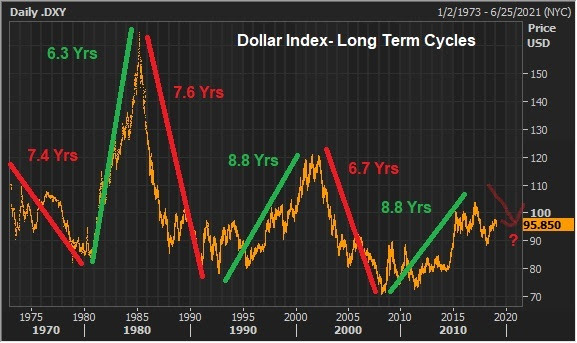 The dollar is down 8% in this new bear cycle, and about two-years into a cycle that should run another five to six years. These are the early innings. A lower dollar should fuel capital flows into foreign stock markets. Among the most interesting: Japanese stocks and emerging markets. 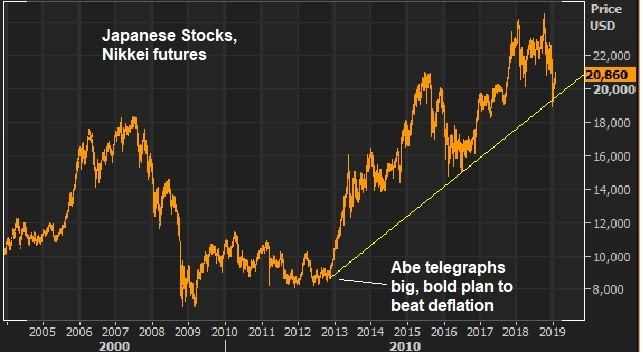 Back in late 2012, Shinzo Abe, then candidate for Japanese Prime Minister, promised a big and bold QE plan to beat two decades of deflation, and he had his hand selected candidate to run the BOJ, in waiting, to execute it. As you can see in the chart on stocks, that beganthe sharp rise in Japanese equities. And that trend too, still holds after the recent sell-off. Seven years later, the Bank of Japan is now the lone global economic shock absorber (i.e. they are the last major central bank still easing and will be in QE mode for the foreseeable future). As part of their QE program, they continue to outright buy Japanese stocks. While U.S. stocks are 10% from the highs of last year, Japanese stocks would still need another 20% to regain the 2018 highs. 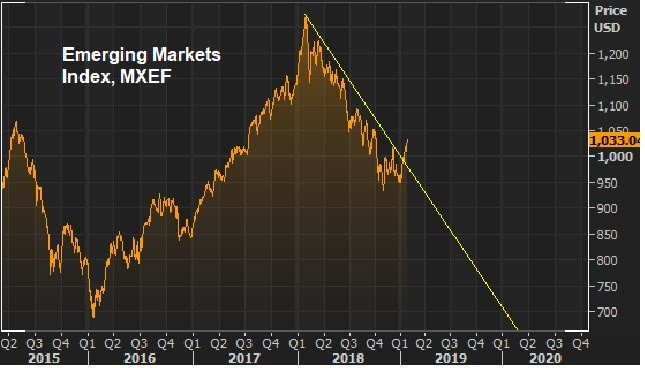 As for EM: If we consider where emerging market stocks were a year ago, and now introduce the possibility that China may be coming to the table later this month with a deal (at least on trade) that will include balancing trade with the U.S. over six years. How might EM economies look if the world’s leading exporter (China) no longer unfairly floods the world with its cheap products? Here’s a look at the chart on emerging markets. You can see we’re getting a big trend-break this month of the ugly downtrend of the past year. 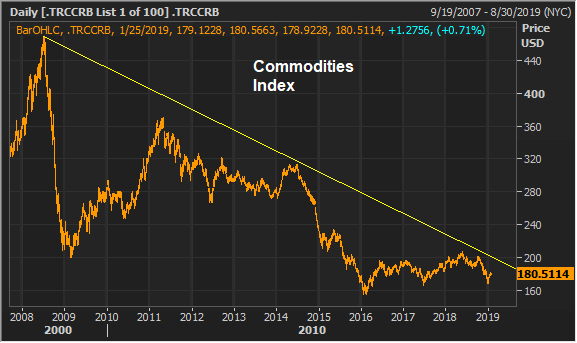 Finally, a falling dollar and a deal with China is jet fuel for commodities. 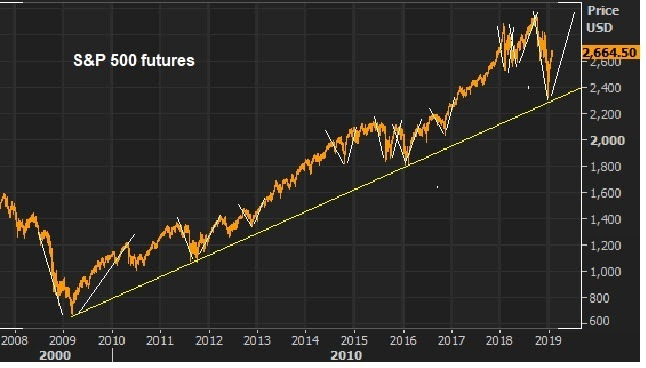 And you can see in the chart below, this huge downtrend of the past decade is nearing a break. With all of the above in mind, I suspect we’ve seen peak pessimism over the past quarter. And markets are showing signs that we might see a spillover of prosperity from the U.S. economy to the rest of the world, rather than another retrenchment in the global economy.